"I just received my necklace with my daughter's birthstones and absolutely love it. I couldn't be more pleased with the service and the quality of the jewelry." "I loved it! I actually ordered for my niece to give to my sister and she loved it! You do great work and I am so glad it all worked out! I definitely will order again. Thanks!" Welcome to Mel Made It. I have linked to my Etsy site while I redo my website. If you don't find what you're looking for, please Email me. I most likely can make what you're looking for if you don't find it here. 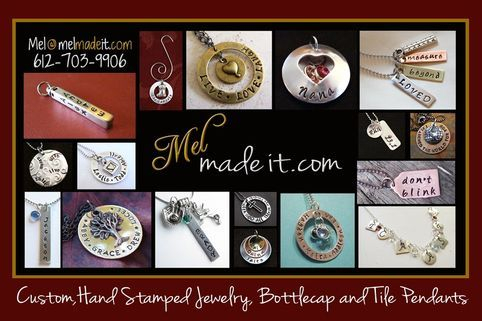 Welcome to Mel Made It...A great place to find personalized hand stamped metal jewelry and personalized gifts. I believe you don't need to spend a fortune to have beautiful jewelry that is easy to maintain. I offer a variety of different metals including sterling silver, aluminum, stainless steel, copper and brass. My goal is to create a one-of-a-kind piece that you'll enjoy wearing for years to come at an affordable price!